Thunderstorm phobia in dogs is not only a real thing, but it is also a common issue many pet owners deal with. Needless to say, this anxiety problem affects our dog’s quality of life, as well as our own. There may be several factors that contribute to your dog’s anxiety. Apart from the loud noise, he can also sense oncoming storms. For example, changes in the barometric pressure usually happen just before a thunderstorm. While we cannot feel this, your dog certainly can, as it causes an uncomfortable build-up of static electricity in the fur. Of course, you can try a number of different things at home in order to help your dog stay relaxed on a stormy day. However, if the anxiety is severe, you should consult with your vet about the best treatment plan. In this post, I will teach you how to comfort a dog during thunderstorms, including what natural supplements you might want to try. How To Comfort A Dog During Thunderstorms, Fireworks, etc. Dogs are highly susceptible to picking up on human emotions. Therefore, if your dog is scared of thunderstorms, the best thing you can do is let him know you are there for him. Also, do not worsen your dog’s anxiety by getting mad at him, as it will only make him feel worse. Instead, react calmly and help him gain some confidence by reassuring him that he is safe. And no, doing so will not make your dog become even more scared. 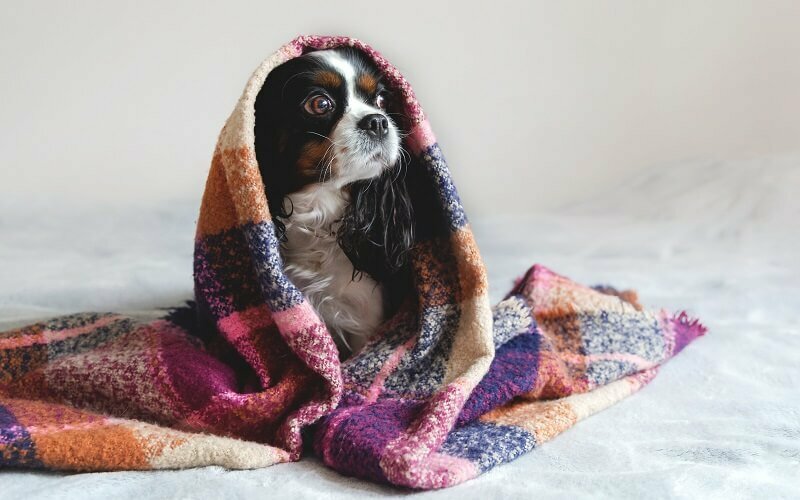 Whether it is a heavy-duty kennel, an interior room without windows, or the basement, your dog needs a shelter where he can feel protected from the approaching storm. This place should always be available and associated with positive things like treats and toys. If you decide to use a crate, then be sure to leave a cushion or thick blanket inside so your dog can snuggle up. Also, do not to lock the kennel door, as it will make him feel trapped and more anxious. If you have a room with windows, do your best to cover them and turn on the lights so your dog cannot see what is going on outside. Dog behavior modification (sometimes referred to as positive reinforcement) is a training technique used by many pet behavior specialists and trainers in order to replace unwanted behavior with wanted or expected behavior and it usually includes treats, praises, or a favorite toy. The act of giving your dog a reward when he is calm will not only make him feel different about storms, but it will also divert his attention from it (as long as you do it in a room with minimal distraction). Another thing you can do is to train your dog to tolerate exposure to thunderstorms. Yes, I know this sounds counterproductive, but desensitizing your dog to low storm sounds while he eats or plays will create a positive effect in his relationship with bad weather. You can increase the volume of the sounds over time, but do it slowly, and stop if your dog starts to show signs of stress. Music is a natural antidepressant and mood enhancer for humans, as well as for dogs (this is why it is often used in shopping centers and other public places). By playing soft music for your dog, he will be calmer, and it will also minimize the noise of rain and thunders coming from outside. You can search YouTube for ‘Relaxing Music for Dogs’ or go straight to this popular channel. A ThunderShirt, (also known as Storm Jacket or Snug Garment) is specifically designed to treat thunderstorm phobias by applying constant pressure on the dog’s torso. Your dog will feel as though he is constantly being hugged, which provides comfort while helping him deal with behavior problems such as fear of thunders, but also separation anxiety, walks, car drives, and alike. This product has a high success rate, but if you are not happy with the results, you can return it and ask for a refund. How To Use A ThunderShirt? First of all, do not wait to put the shirt on when there is a storm outside. At that point, your dog is already anxious, and you should not stress him out even more. Instead, help him get used to wearing the jacket, preferably when he is fully relaxed. For example, let him walk around with it for about ten minutes each day as that should be enough time for him to get used to the feeling and understand the boundaries of his body. I have heard about dogs that show an instant positive reaction to this solution, but some may take a couple of weeks to adjust. And while it is usually considered safe to wear the ThunderShirt in situations where you have to leave your dog alone during a storm, I suggest you check for any signs of irritation once you get back. Remember I talked about the changes in the barometric pressure? Well, this static charge can build up and irritate your dog. There is a solution for this called Storm Defender, which looks just like the ThunderShirt. The difference is that this product can also discharge the coat from static buildup and reduce your dog’s sensitivity to it by using a special metallic lining. For a similar result, you can simply cover your dog’s crate with a double layer of aluminum foil. Always ask your veterinarian before trying new supplements! Melatonin is a naturally occurring sleep hormone that has been shown to reduce anxiety in dogs, as it promotes calmness and relaxation. Normally one tablet of K9 Choice Melatonin thirty minutes before the storm starts is enough, but talk to your vet first and ask about the right dosage for your dog. Rescue Remedy is a natural treatment for stress relief made from a blend of flowers that helps your dog cope with anxiety-producing situations. This product works on dogs of all sizes and is free of alcohol. You can drop the solution on a treat, add a few drops into a water bowl, or rub your dog’s paw and belly with it. But make sure you get the Rescue Remedy for pets and not the human form. The last natural supplement I recommend to use is lavender, a popular essential oil that is known for its relaxing properties. While you don’t want your dog to ingest it, you can put one drop of high-quality oil on his collar or paw pad so that its sweet and soothing smell will help calm his nerves.